Children have repeatedly proven themselves to have some of the most innovative and useful ideas when it comes to scientific breakthroughs. The out-of-the-box thinking demonstrated so often by Terra Scholars makes a science fair for homeschoolers to be an especially exciting proposition. 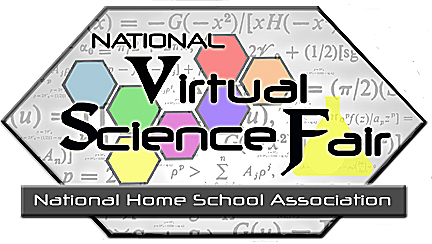 With the focus more on collaboration than competition this Virtual Science Fair (VSF) will encourage both "Solo" and "Small Group" entries. The objective of the VSF is to help emerging scientists to hone and develop their skills while providing them encouragement and offering them deserved recognition for their efforts. Each completed project will be submitted by April 15th of each year and a schedule will be posted at least one week prior to the beginning of the NHSA Virtual Expo showing which projects have been selected for the VSF Showcase and at what time each project presentation can be seen. Finalists will receive calls with questions from the selection committee prior to making the final selections. Participants will submit a video presentation of up to 10 minutes in length describing their projects in detail. The videos of the selected projects will be shown during the NHSA Virtual Expo in Theater 2. Each video presentation will be followed by comments from the experts who evaluated the project. That will then be followed by a 5 minute live Q&A session, via audio or video call, with the solo scientist or team captain responsible for the submission of the project. Each participant, or group of participants, will submit a notification to the NHSA VSF Coordinator by January 15th at ScienceFair@NationalHomeSchoolAssociation.com of their intent to submit a project for consideration at the VSF so that the NHSA has ample time to arrange for experts in the chosen field of study to evaluate and comment on the project once it is complete. Work on the project itself can commence on January 15th or at any time prior. It can even represent work that has been in process over many years if that is the case. You must Log In as a Member for complete details and entry forms to participate in the VSF.